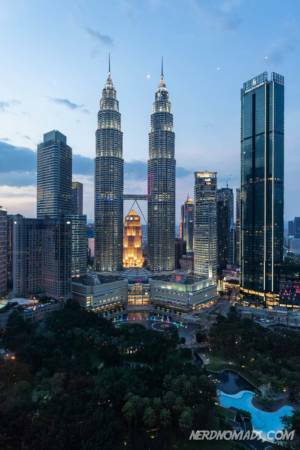 With more than 12 million international visitors last year, Kuala Lumpur (KL) has deservedly positioned itself as one of the top tourist destinations in South-East Asia. The city’s increased popularity has resulted in quite the building boom, and there are now more hotels and hostels to choose from than ever. With so many options, deciding where to stay in Kuala Lumpur can feel quite overwhelming. Kuala Lumpur is a fascinating melting pot of cultures. Walking around you will see beautiful mosques, colorful Chinese temples and Hindu shrines standing side by side with well preserved colonial buildings and modern giant skyscrapers. Every area in the city has its distinct character, from the hyper-modern city center with its towering skyscrapers to the always busy street life of Chinatown. For travelers, each area comes with its own pros and cons. We have been to Kuala Lumpur a lot over the years, ever since our first visit in 2005. 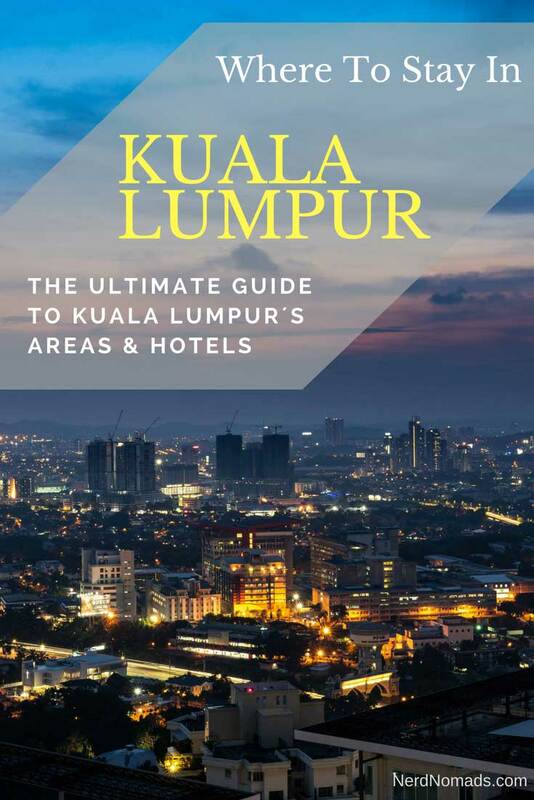 When we decided to put this guide together, we could have relied solely on our past experiences, but we felt that to create a truly excellent resource for anyone planning a trip to KL, we needed to do more. So we booked some plane tickets and ended up spending six weeks in KL exploring the city’s neighborhoods in depth. The result is this guide. It’s our little love letter to this city, and it’s diverse, fascinating neighborhoods. Here we reveal what we think are the best areas to stay in Kuala Lumpur, and why. We tell you all about the most popular areas, but we have also included some personal favorites for those who want to avoid the tourist crowd. For each area, we have listed our favorite hotels at any budget – Top-End, Mid-range, and Budget. 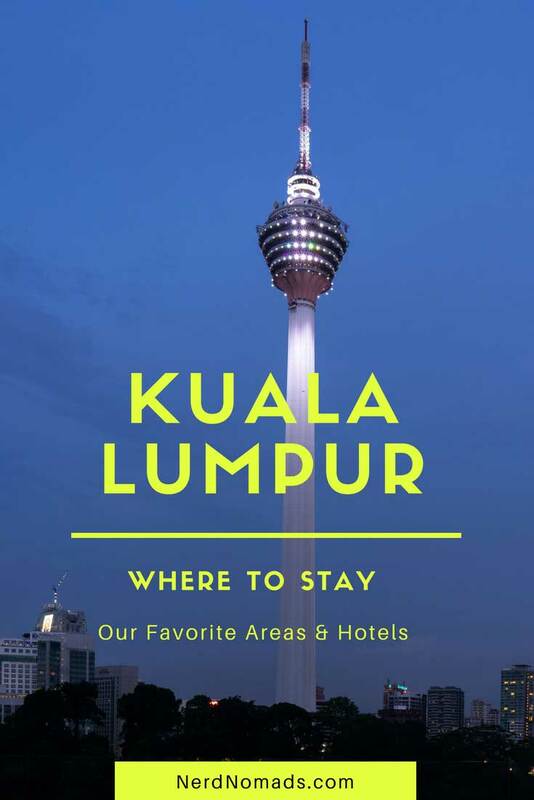 Whether you are looking for that once in a lifetime luxury hotel, a small intimate boutique hotel, a value-for-money mid-range hotel or a budget guesthouse, Kuala Lumpur will surely not disappoint. Compared with most modern cities, Kuala Lumpur is an inexpensive city to visit with plenty of places to stay at within any budget. The higher end accommodations tend to offer exceptional value, often available for much less than what you would have to pay for the same hotel standard elsewhere. The hotels recommended in this article are mostly places we have stayed at ourselves. To make this as complete and helpful a resource as possible, we have included some recommendations from travelers who we know personally and whose opinion we trust. We hope you find this guide helpful in choosing the best place to stay in Kuala Lumpur. Bukit Bintang area is the place to stay in if you want to be where the action is, close to all the excellent shopping, dining and entertainment that Kuala Lumpur has to offer! Bukit Bintang is the most popular area to stay in, and for a good reason! Here you are close to everything, like modern shopping malls, cinemas, restaurants, and lively nightlife. Whether you want to eat at fancy up-scale restaurants or cheap street food hawkers, Bukit Bintang has it all. Why Stay In The Bukit Bintang Area? If you like being where the action is, with short walking distance to restaurants, cafes, street food, and shopping malls, then Bukit Bintang is the perfect place to stay! Bukit Bintang is an easy and convenient area to stay in as you will find everything there. The area also has Monorail and MRT stations. So it is easy to get around the city if you are staying in Bukit Bintang. You can also easily get a taxi or Grab. You will find some excellent hotels, apartments, and hostels to stay at for most budgets in the Bukit Bintang area. 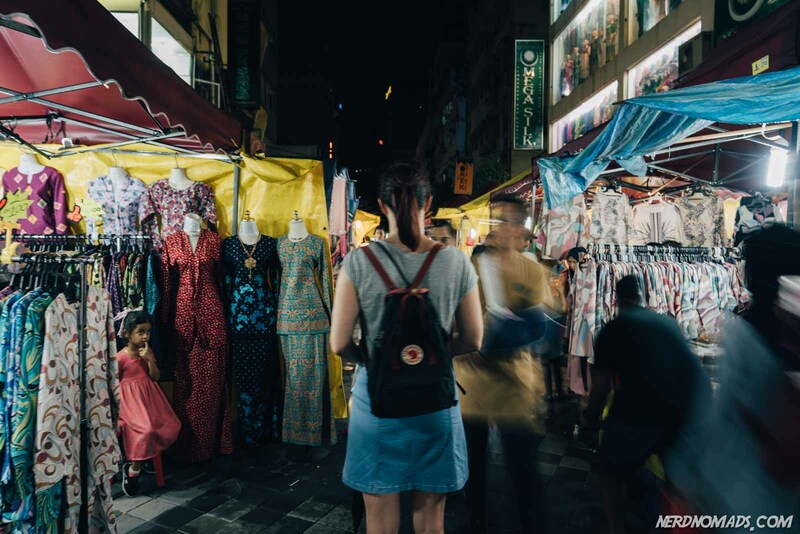 You will also find Jalan Alor in Bukit Bintang, the city’s most famous hawker food street where dozens of restaurants and food stalls come to life as the sun sets. Great fun! Jalan Alor is equally popular with locals and visitors and is a must visit. You will not go home hungry from Jalan Alor. If you are looking for a great pub crawl evening, visit Changkat Bukit Bintang street where bars and restaurants line both sides of the road in pre-war colonial houses. You can also head over to the closeby Jalan Mesui street which also has lots of restaurants and bars. Jalan Mesui street is more laid-back than Changkat street. Shopping – Visit the large Pavillion mall for some world-class shopping. 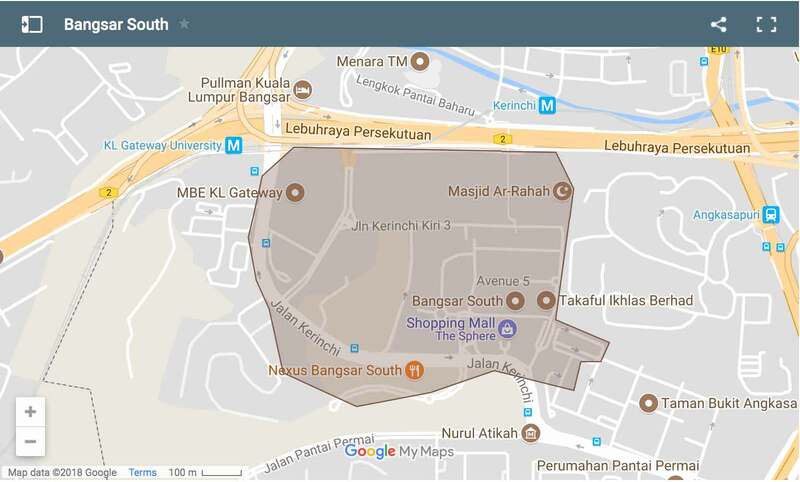 Other notable malls include Sungai Wang Plaza and Berjaya Times Square. 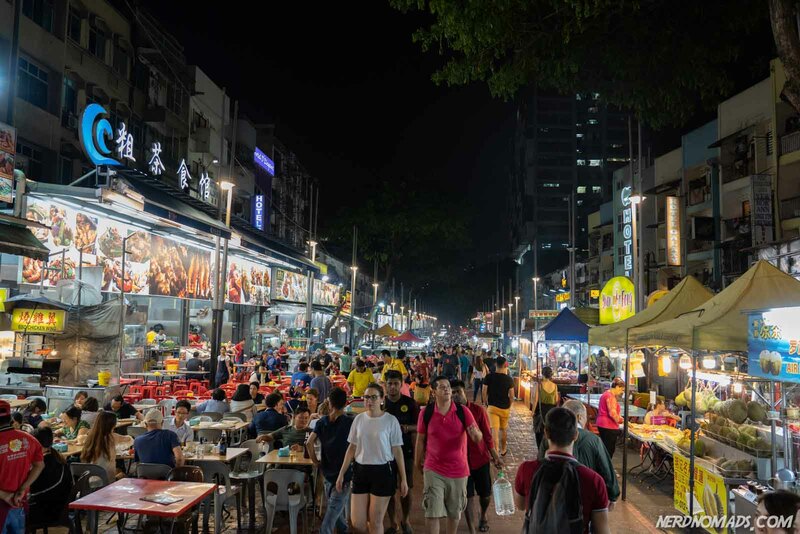 Jalan Alor Street Food – Sample the street food along Jalan Alor, the famous hawker food street gets packed every night as locals and tourists come out to eat some delicious street food. The Chinese food stalls dominate somewhat but there are also plenty of stalls serving Malay, Japanese and middle eastern food. Changkat Pub Street – Party along Changkat street, a row of pre-war colonial buildings converted into KL’s most famous pub and restaurant street. Heli Lounge Bar – Watch the sunset from the Heli Lounge Bar. 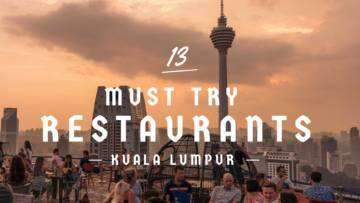 Have a drink on top of a helipad at this laidback rooftop bar and watch the sunset over KL. Lot10 Food Court – Lot10 Hutong, a food court that is famous for having managed to gather many of the best street food restaurants in Kuala Lumpur under one roof. Plaza Low Yat IT Mall – Go electronics shopping Malaysia’s largest IT mall. TREC clubbing – East of Bukit Bintang (Jalan Tun Razak) has KLs largest clubs and discos, like Zouk, and also live music venues on Fridays and Saturdays. Bukit Bintang can get a bit hectic and busy, especially in the evenings and on the weekends. We sadly only had a short stay at the Ritz-Carlton Hotel, a couple of nights. We felt like royalties from the moment we entered the lobby. The excellent service that the staff gave us truly made it feel like a home away from home. We even had our own butler! He came to our room with complimentary drinks, polished our shoes for free, and made our beds in the evening. Great service! 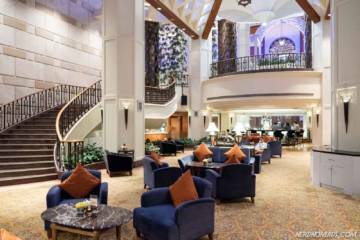 The Ritz-Carlton is one of Malaysia’s finest hotels. It is a great luxury option at a price that is much more affordable than similar properties in other parts of the world. The hotel has kept its old-world elegance. We loved the impressive lobby area and our spacious room with every imaginable comfort including a huge marble tiled bathroom with both a bathtub (and bath salt!) and a separate shower. We spent a couple of hours by one of the outdoor swimming pools (there are actually two outdoor swimming pools, one for adults only), and we even got the time to have a workout in the fitness center. The fitness center, by the way, is one of the best hotel gyms we have ever tried. It really has everything! We did unfortunately not try the elegant Spa Village, but it looked amazing. The Ritz-Carlton is in a perfect location too, right next to the Pavillion Shopping center with all its shops and restaurants. We used the walkway from the hotel over to the Starhill Gallery shopping mall. From there it is easy to access to exploring Bukit Bintang. You can not go wrong by staying at the Ritz-Carlton Hotel. Other excellent top-end hotels in this area include the JW Marriott Hotel and The Westin. We loved the modern design of the rooms, very likable and comfortable. The staff is super friendly, and there is a lovely restaurant on the 2nd floor. We had dinner outside on the balcony of the restaurant (you can also sit inside) and had a great view of the street. We did, of course, L-O-V-E the newly renovated infinity rooftop swimming pool. The perfect place to wind down and relax with a couple of drinks after all the sightseeing and shopping in KL. If you are traveling with a family and kids, or prefer a large apartment, then Lanson Place is perfect for you! You can choose the size of your apartment and even have several bedrooms. Our apartment had two bedrooms, two bathrooms, and a huge living room (with a large dining table and a big comfortable couch and TV), and a full kitchen. We could have stayed there forever, as our huge, modern, well-equipped apartments really had everything needed for short or long stays. The kitchen was large and had a full set of kitchen utensils. We found the washer/ dryer (located in its own room) to be super convenient. The living room has a huge flat screen tv and even a surround sound system! Lanson Place has the biggest swimming pool we have ever seen! The main pool is Olympic sized (50 meters), and there are several children pools and a big Children’s playroom. We enjoyed the cafe that is located just next to the pool, perfect to grab something to eat and drink. The gym is excellent with everything you need to get a good work out. There is a separate Yoga/ dance room with Yoga classes. Lanson Place is located in Bukit Ceylon, and you can easily walk to Jalon Alor or Changkat pub street in less than 5 minutes. 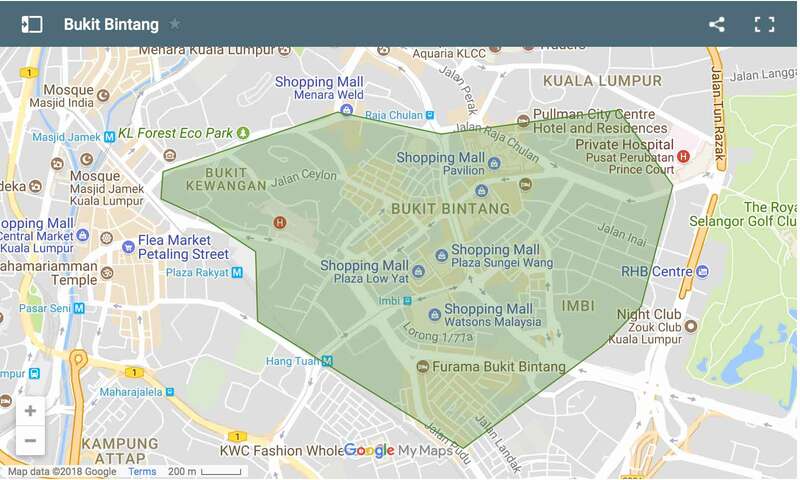 The shopping malls of Bukit Bintang in about 10 minutes away by foot. If you are staying at Lanson Place, check out the fabulous and famous restaurant Bijan just a few hundred meters from Lanson Place. They serve excellent Malaysian food. A fairly new (opened in 2016) hotel that offers excellent value for your money! We loved our room, which was well designed, modern and comfortable with air-con, a large flat screen TV with international channels, free wifi, and a minibar. Since we love swimming pools in general, we spent some time at the rooftop pool (it is not the biggest but very nice). There is a great view from the pool overlooking the city, and a well-equipped gym. The hotel has a great location. 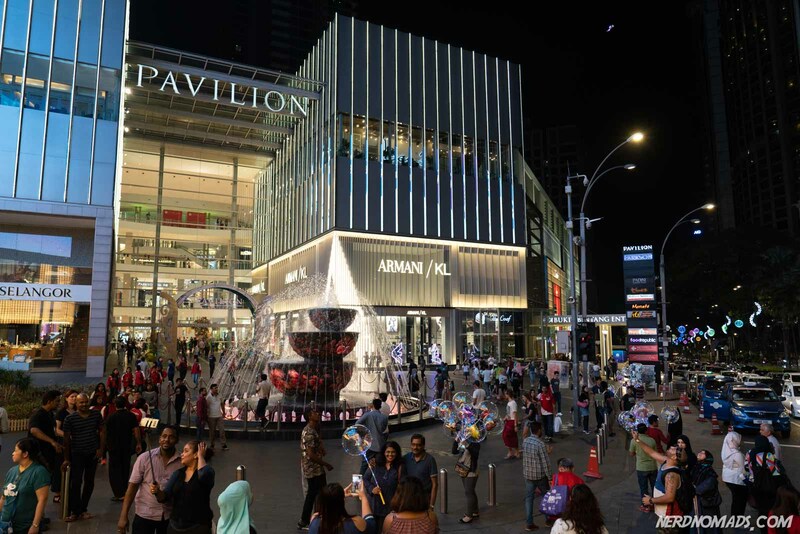 You can easily walk to the Pavilion shopping mall and all the action of Bukit Bintang in 15 minutes. To sum up: Mercure Kuala Lumpur Shaw Parade is a very nice and comfortable hotel to stay at. Paper Planes Hostel is arguably the best hostel in Kuala Lumpur! 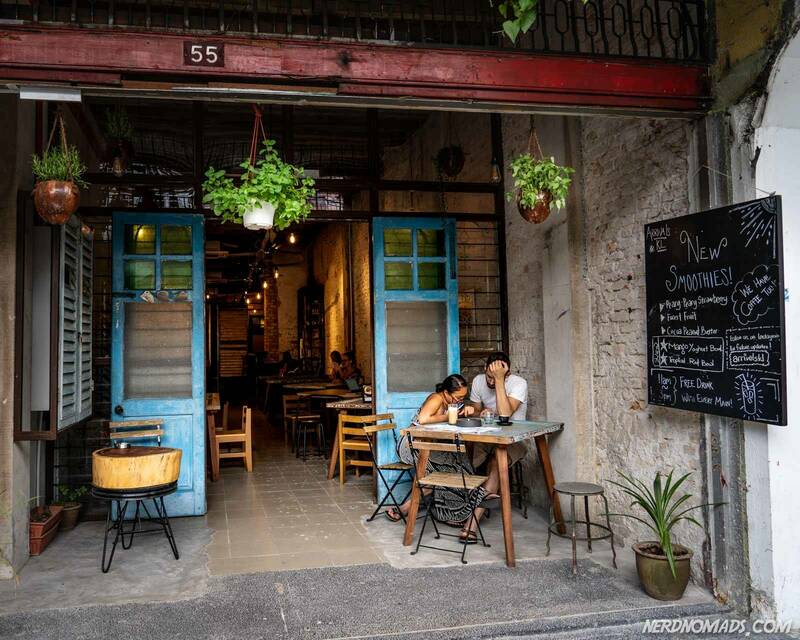 Originally an old shophouse, it has been beautifully converted into a wonderful hostel. It has a quirky, cozy interior design with super clean, air-conditioned rooms, comfortable beds, and spotless bathrooms. Both dormitory style and private rooms are available. The atmosphere is relaxed with hosts that go out of their way to help travelers. There are free mineral water and complimentary coffee and tea in the morning. Paper Plane Hostel is located in a quiet residential area, yet the Bukit Bintang craziness is just a 10-minute walk away, or you can use the nearby Hang Tuah Monorail station. There are some cool cafes on the neighboring street. Try the VCR Coffee & Cakes for granola, coffee or a cake. We love them! 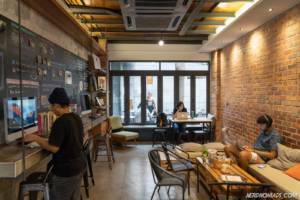 Another excellent option for budget travelers is the KL Backpacker. Clean, comfortable dorm room beds with friendly service and sociable, good vibes within walking distance of Bukit Bintang. Kuala Lumpur City Center, or KLCC for short, is next to Bukit Bintang the most popular area to stay in Kuala Lumpur. This is where you find the famous and spectacular Petronas Towers, the worlds tallest twin towers. Many of the hotels in this area have views of the Petronas. 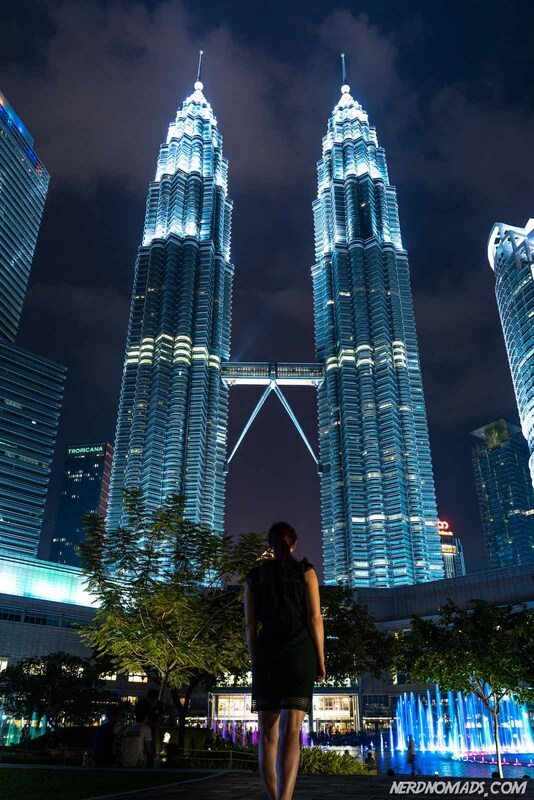 Maria in front of the spectacular Petronas Towers! Gazing up at the beautifully illuminated Petronas Towers is an experience not soon forgotten, and by staying in this area you can have this view from your hotel room. It does not get any better! Staying in this area will put you right in the middle of everything, with lots of restaurants and shopping nearby. And with the elevated, covered walkway that links KLCC with Bukit Bintang (see the area above), you can easily walk to even more restaurants, shopping and street food. Another highlight of this area is the lovely green and lush KLCC Park, perfect to go for an afternoon stroll or run, let the kids play, and to see the magnificent light show in the water fountain. 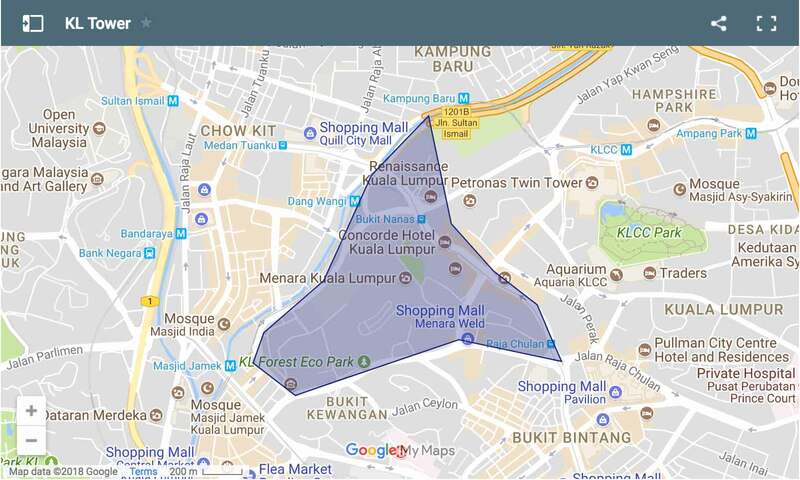 Why Stay In The KLCC Area? KLCC is a great area to stay in if you are looking for great and luxurious hotels, high-end restaurants, and a more sophisticated nightlife than Bukit Bintang. There is a whole cluster of upscale shopping malls here, with the Suria KLCC mall at the base of the towers being the crown jewel. You will never get bored in KLCC! Just in front of the towers is the beautiful KLCC park, a favorite green lung in a city that otherwise has very few parks. Here you can relax and escape the concrete for a little while, or join the crowds for an evening run as the park has a 1,3 km long soft-surface jogging path. There is a children’s playground and a public pool here as well. Every evening the fountains in front of the tower light up with a spectacular light show called Lake Symphony, where the water and colorful lights dance to music. KLCC is also well served by public transportation, and if you enjoy walking Bukit Bintang can be reached in less than 30 minutes by foot. Or you can easily get a Grab by the Grab App. Petronas Towers – The iconic twin towers is one of the worlds most impressive modern buildings. Be sure to visit in the evening when the towers are lit up in all their glory. KLCC Lake Symphony Water Show – Every evening at 20:00, 21:00 and 22:00 the fountains in the KLCC Park performs a spectacular colorful, choreographed dance show to music. 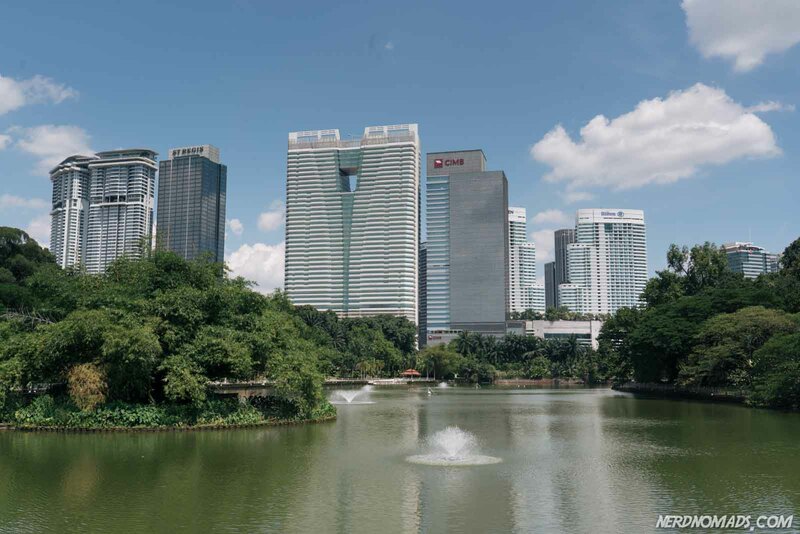 KLCC Park – The areas green lung provides a peaceful escape from the otherwise hectic city life and a wonderful place for an afternoon walk. 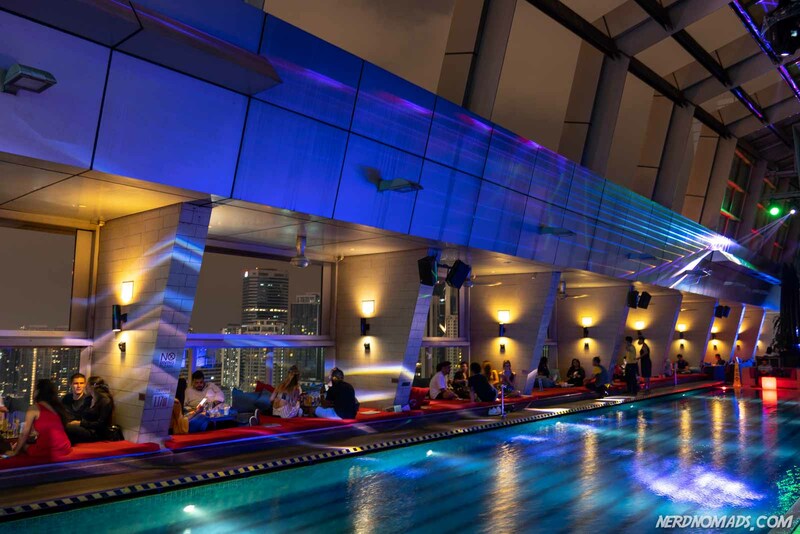 Traders Hotel Skybar – The famous Skybar on the 33rd floor at the Traders Hotel is well worth a visit for its spectacular view of Petronas Towers. No tripods allowed. Aquaria KLCC – An impressive aquarium with a 90-meter underwater tunnel you can walk through. Suria KLCC Mall – An enormous shopping mall at the foot of Petronas Towers filled with international brands. Their food court is an excellent option for cheaper meals. There is also a supermarket in the basement. Petronas Art Gallery – Take a look at the thousands of local and international paintings, photographs, and sculptures displayed at the Petronas Art Gallery inside the Suria Mall. Petrosains Technology Museum – A technology and discovery museum inside the Suria Mall. KLCC is an expensive part of the city to stay in, and there are limited accommodation options beyond the top end luxury hotels. 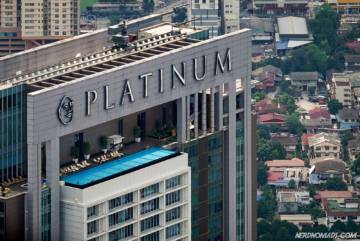 The mid-range hotels and apartment-hotels tend to be further away from the twin towers. If you are in need of some pampering, there is no better hotel in KL than the Mandarin Oriental. This hotel has everything! With spectacular views of the Petronas Towers and the KLCC Park, the Mandarin Oriental is a classic oriental luxury at its best. You can enjoy a relaxing massage, a soak in the Jacuzzi or an evening swim in the spectacular infinity pool overlooking the city skyline and Petronas Towers. We loved the service at the Mandarin Oriental, it is world class, and the staff is always friendly and professional. There is a well-equipped fitness center, an indoor golf course and even a tennis court with a coach. We had a lovely room that really lived up to the high standard. It was large and luxurious with every modern comfort. We especially loved the huge flatscreen TV. There is arguably no better place to enjoy the spectacular view of the Petronas Towers from than the Traders Hotel. Located right across from the towers and separated only by the KLCC park in between, the views from the tower facing rooms are genuinely fantastic! Being able to just step out of the hotel and go right into KLCC park is an added bonus which we loved. So convenient! While we enjoyed the spectacular views from both our room and the Skybar, we think that the rooms, although comfortable and spacious, could do with a little refresher. 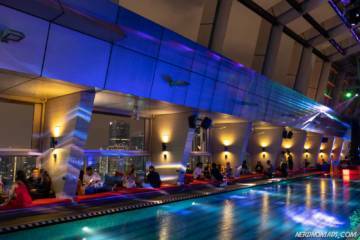 There is also no outdoor swimming pool, just the one indoor as part of the Skybar. Villa Samadhi is a real oasis! It is a unique and stunning luxury villa resort located in a fantastic garden. By staying here, the big and busy city KL fades away and you can feel totally relaxed and find some peace and quiet. The gardens and pool that connect all the rooms create a peaceful oasis. The rooms are very spacious and elegantly furnished in a luxurious contemporary Asian style which we love. There is a complimentary cocktail hour every evening, and the service is everything you would expect from a five-star hotel. The price of this hotel is a little steep, however, but if you are looking for something truly unique and memorable, then Villa Samadhi is the one to book! There is nothing else compared to this hotel in Kuala Lumpur. 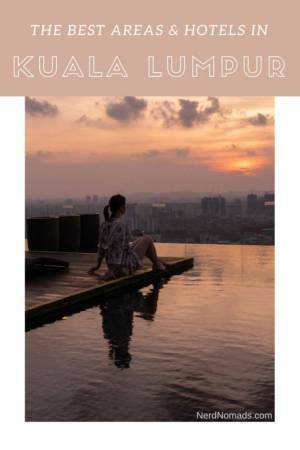 We did, of course, appreciate the rooftop infinity pool which has a great view and is a lovely way to relax after a day exploring KL. There is also a gym and a restaurant at the hotel. Petronas Towers are 15 minutes easy walk away. G Tower Hotel offers a lot for your money if you are looking for a decent mid-range hotel. Decently sized, clean, comfortable rooms with lovely views in a central location above the KLCC LRT Station and a 5-minutes walk from Petronas Towers/ Suria Mall. One of the few good budget options in this part of town; rooms have air-con, minibar, free wi-fi, and a flat-screen TV. Sadly there is no pool or gym. The KL Sentral area is a convenient area to stay in as it is home to KL Sentral Train Station, Kuala Lumpur’s main transportation hub. From here you can quickly and easily get to any part of the city or to the rest of Malaysia, Thailand, and Singapore. All the city’s many forms of transportation interlink here including the MRT lines, LRT trains, monorail, and the airport Klia Express train. There are a lot of nice high-end international hotels in this area, as well as restaurants serving both local and international food. 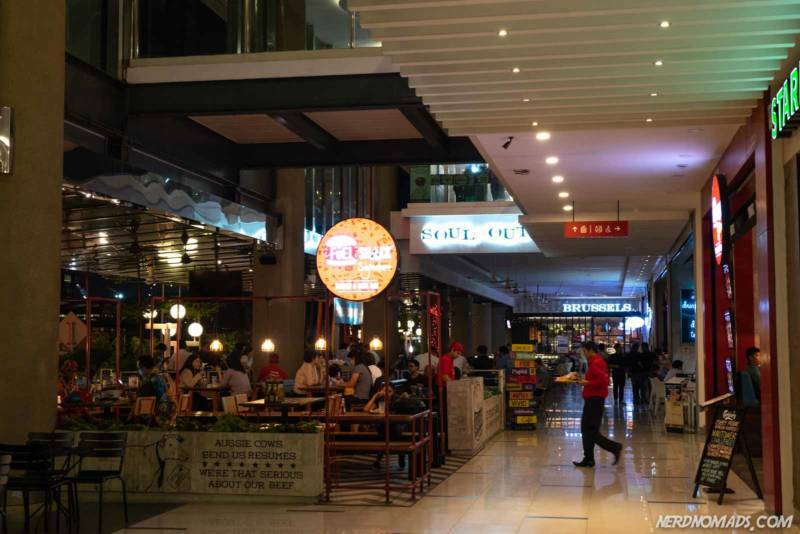 The big NU Sentral Shopping Mall is connected to the KL Sentral Station and has a huge selection of shops, restaurants, cafes, a convenience store, and a cinema. Why Stay In The KL Sentral Area? It’s nice to be so well connected with public transport. The LRT line quick and easy takes you right to the KLCC area with the Petronas Towers and Chinatown. The monorail is convenient for getting to the Bukit Bintang area with the big shopping malls and the best street food. The KTM Komuter train is great for a visit to the Batu Cave Temple (30 min train ride) and to Mid Valley Mega Mall. The beautiful Lake Garden, the city’s largest park, with its Botanical Gardens, the KL Bird Park, museums and the National Mosque is also within walking distance if you choose to stay in this area. The beautiful park Lake Gardens. In the distance St. Regis Hotel and Hilton Hotel. Brickfield / Little India is a short 10-minute walk away from KL Sentral station and is a fun area to explore and a great place to eat authentic Indian food. Perdana Botanical Garden – The cities largest park Lake Gardens is home to a deer park, a lake, orchid garden, and a herbarium. KL Bird Park – The worlds largest free-flight bird park is well worth a visit. KL Butterfly Park – Experience more than 100 species of colorful butterflies up close in this beautiful park. Islamic Arts Museum – Admire fantastic work collected from around the Islamic world. 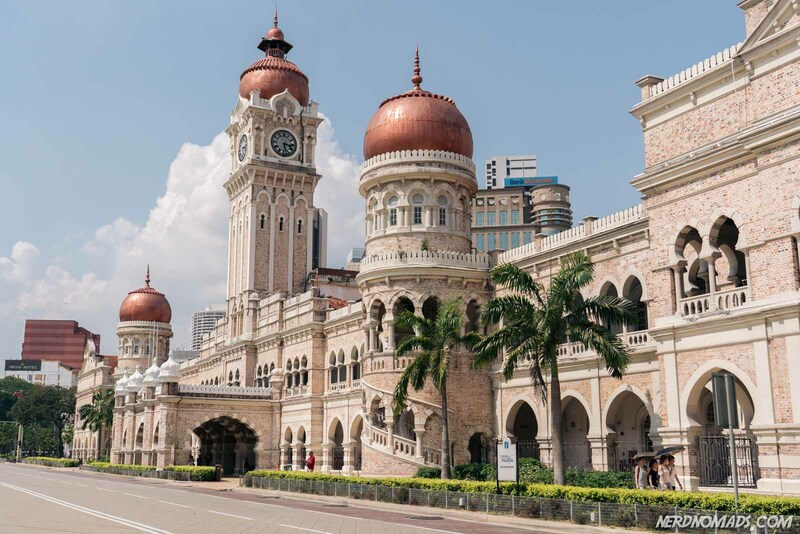 National Museum – Learn about Kuala Lumpur’s history. Rent a bike – Perfect for exploring the park and the city. City bikes can be found all over the city at designated oBike stops. Little India – Explore the colorful and vibrant Little India and try some delicious Indian food from the hawkers around the fountain. It’s not the most accessible area to get around on foot, which means that you frequently have to traverse busy streets or take detours to look for places to cross the roads. To remedy this many of the high-end hotels in this area offer free shuttle service to and from the station. The Majestic Hotel is a truly spectacular hotel that impressed us in every way and we felt at home here immediately. 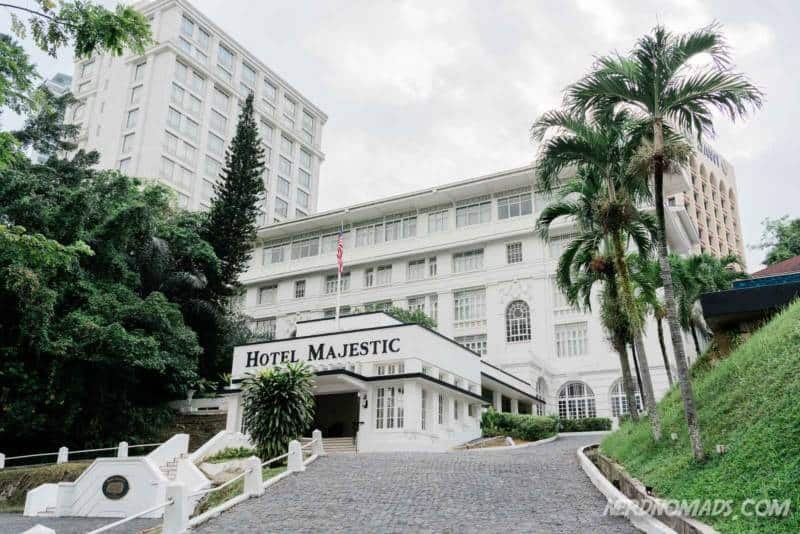 The Majestic Hotel is one of the last true classic luxury hotels of Kuala Lumpur and has been around since 1932. The recent complete restoration has modernized the hotel while still keeping its old world colonial style charm. Seldom have we been met with such genuine smiles and service from everyone from the doorman dressed in his colonial-style uniform to the reception staff. The service is amazing at this hotel! We loved the afternoon tea service in the salon and the beautiful orchid room. The hotel has a lovely outdoor pool and a well-equipped gym, and a super cool old vintage bar. If there are any drawbacks to this hotel, it has to be that it’s location almost inside the Lake Gardens makes it a little difficult to walk to KL Sentral Station, and the surrounding shops and restaurants. To remedy this, no less than three frequently running free shuttles are available to take you to different parts of the city – the KL station, Mid-Valley Mega Mall and Bukit Bintang (Starhill shopping mall). These fee shuttle buses run every 30 min or so, and they were very convenient for us and we used them every day. The hotel is surprisingly affordable for the level of service and comfort it offers. It’s a unique opportunity to step back into another era. The Majestic is a real five-star hotel and you will love it! 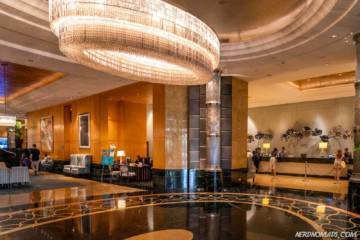 St. Regis Hotel is Kuala Lumpur’s newest ultra-luxury hotel. It is still very much built in the style of old-world elegance. The theme here is old-Hollywood with its glitz and glamour, and the decor of the hotel is beautiful! We totally fell in love with the style of this hotel as it is so consistent. We had a huge room with walk-in closets, a stunning bathroom, and a butler service. The room was beautifully decorated decoated with classic dark wood and grey furnishings. No expense was spared in making this the ultimate Kuala Lumpur luxury hotel, and it is perfect. Another great top-end hotel in this area is The Hilton. The Aloft Hotel is a trendy hotel conveniently located right next to the KL Sentral Station and connected to the Nu Mall with all its shops and restaurants. Although our room was a bit dark, it was stylishly decorated in a trendy colorful style, well equipped, and spacious with large comfortable beds. The free WIFI was very fast which we appreciated. We particularly enjoyed the rooftop pool and bar with its spectacular view of the city. Service was friendly and professional. All in all, the Aloft Hotel is excellent value for money and we had a great stay there. The main jewel and attraction in this area is the spectacular KL Tower, or Menara Tower, as it is formally named. It is one of the iconic landmarks of Kula Lumpur. Built in 1995, and rising 421 meters towards the sky, this communication tower is visible from much of KL. The open-air deck at 300 meters has a spectacular view of the city. Surrounding the KL Tower is the Eco Park, consisting of the last remains of the original rainforest in Kuala Lumpur. There is a very cool canopy walk through the treetops 30m meters above ground. The canopy walkway is a must-visit! The area itself is called Bukit Nanas and consists of a mix of residential apartments, hotels and some small shopping malls. 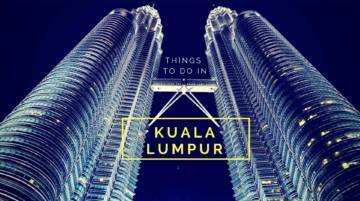 Why Stay In The KL Tower Area? 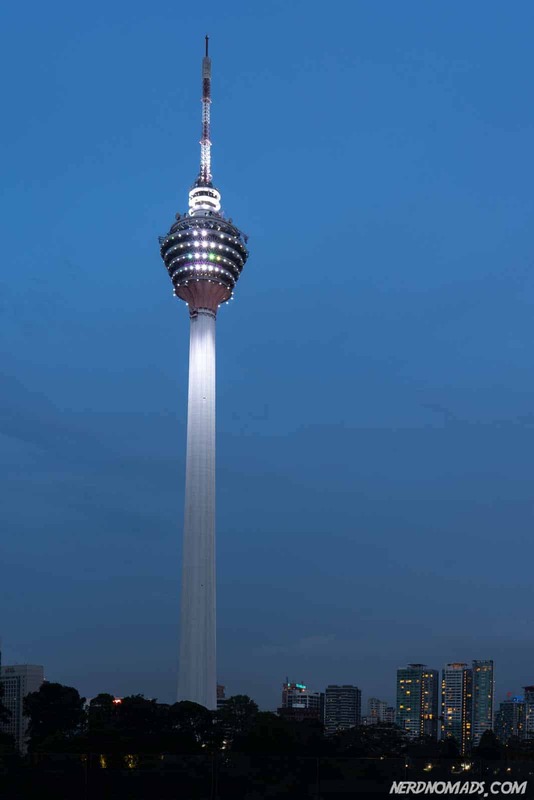 The KL Tower Area is a very centrally located area, roughly halfway in-between Bukit Bintang and KLCC, which means that you can easily walk to most places. 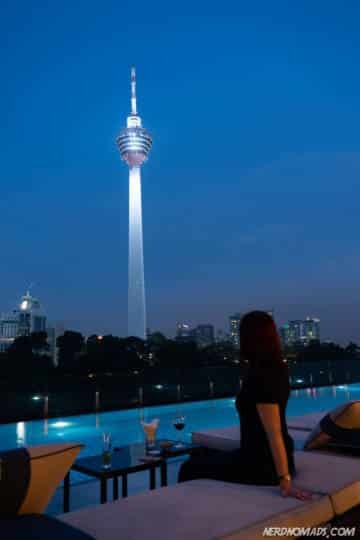 There are some excellent high-end and mid-range accommodation options in the KL Tower Area. KL Tower – The tower itself is well worth a visit. Especially the open air deck at 300m, access to which is weather dependent. 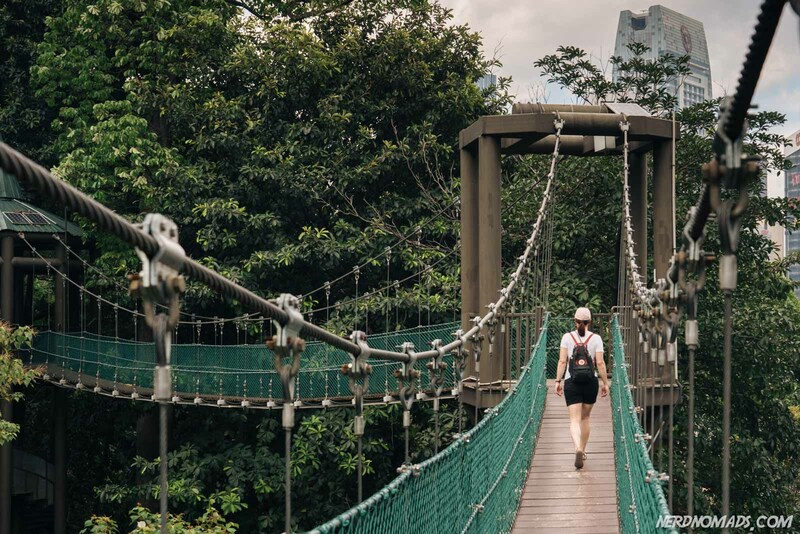 ECO Park – Walk along the supercool canopy walk among the treetops in KL’s last remaining rainforest, 30 meters above ground. Apart from the KL Tower and Eco-park, there are not a lot of other sights in this area. This is more of a residential and business area with limited options for shopping and late dining. Most visitors head for either KLCC or Bukit Bintang, which is only a walk away, to eat and enjoy KL’s nightlife. 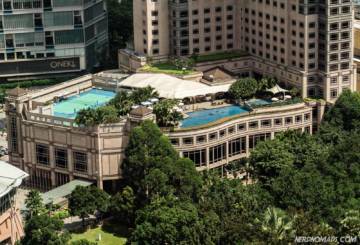 The Shangri La is one of KL’s most popular hotels. The hotel has for more than thirty years taken excellent care of its guests. The legendary service is still intact and worthy of its five-star status, and every effort is made to make you feel special. Although this is a rather old hotel, we found the rooms well-maintained, spacious and comfortable with large bathrooms. You can also upgrade to a Horizon Club room which comes with airport limousine pickup, in-room check-in and use of a private lounge. If you are looking for an apartment, then THE FACE Suites located in the Platinum building is an excellent choice. 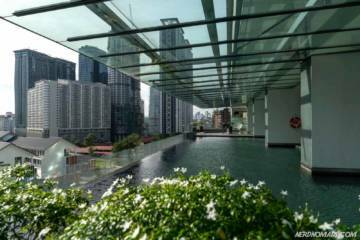 With the spectacular swimming pool, big fully-equipped apartments, and a location within walking distance of the Petronas Towers, and it’s easy to understand why the Face Suites is so popular. Fraser Place is an older apartment residence building with everything from studio to three-bedroom apartments. We had a studio apartment which was well laid out with a workspace, a walk-in closet, washer/dryer for clothes, and a relaxing bathtub. There were a small kitchen and a dining table area which was very convenient. There is an outdoor infinity pool, fitness center, game room, and sauna. 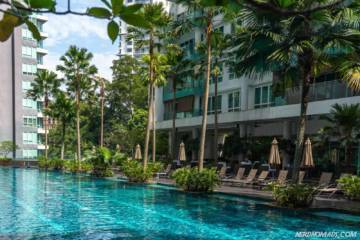 With a central location close to Petronas Towers (a 5-minute walk) and Bukit Bintang (a 15-min walk), this is an excellent choice for families or larger groups looking for a great value-for-money-option. This was the cheapest hotel option we could find in KL with fully equipped apartments. Kuala Lumpur began in Chinatown. Chinese immigrants settled where the two rivers Gombak and Klang ran together and started the trade that would grow to become the Kuala Lumpur city we know today. Trade is still very much the order of business today, with small shophouses lining the streets. The main tourist strip is Jalan Petaling, where vendors sell all the usual tourist souvenirs and t-shirts, but also delicious street food, snacks, and drinks. Jalan Petaling is well worth a visit! 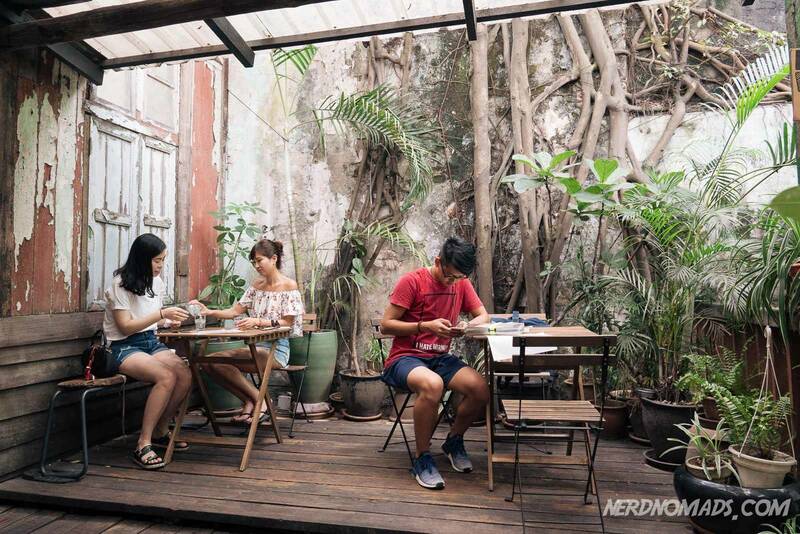 The area is rich in historic buildings and old cafes that have been there for decades, if not longer, but also some hip and trendy new cafes are starting to appear. When the British settled, they established their base around Merdeka Square and constructed several substantial colonial styled buildings. The buildings have been beautifully restored, and Merdeka Square is a fascinating area to walk around. Merdeka Square is one of the most visited and photographed parts of Kuala Lumpur. 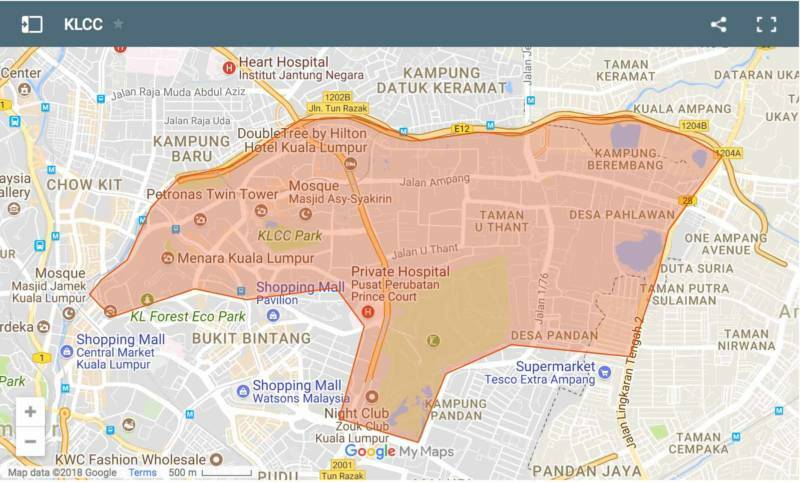 Why Stay In The Chinatown & Merdeka Square Area? There are a lot of budget and backpacker style accommodation options in Chinatown, making it a great place to meet and mingle with other travelers. Chinatown also has some of the city’s best street food restaurants, often open both day and night. The atmospheric narrow alleyways, old Chinese buildings, beautiful temples, and the hustle and bustle makes Chinatown a fascinating area to stay in. 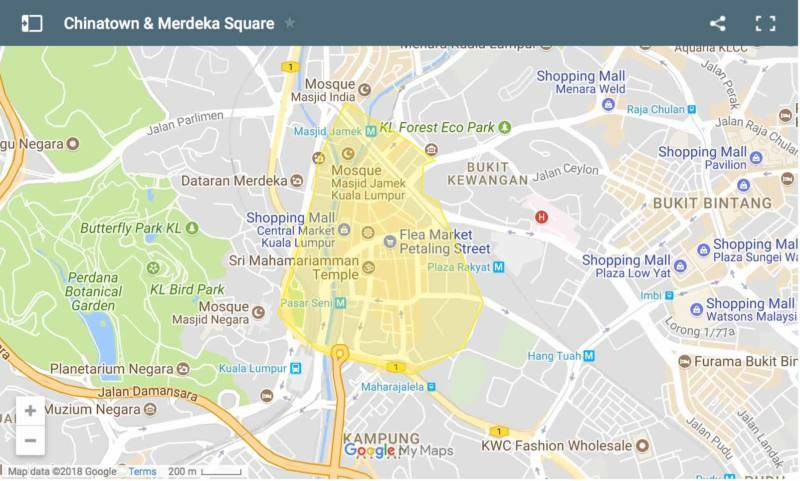 Merdeka square itself does not have a lot of hotels although there are a few around the nearby Masjid Jamek MRT station. 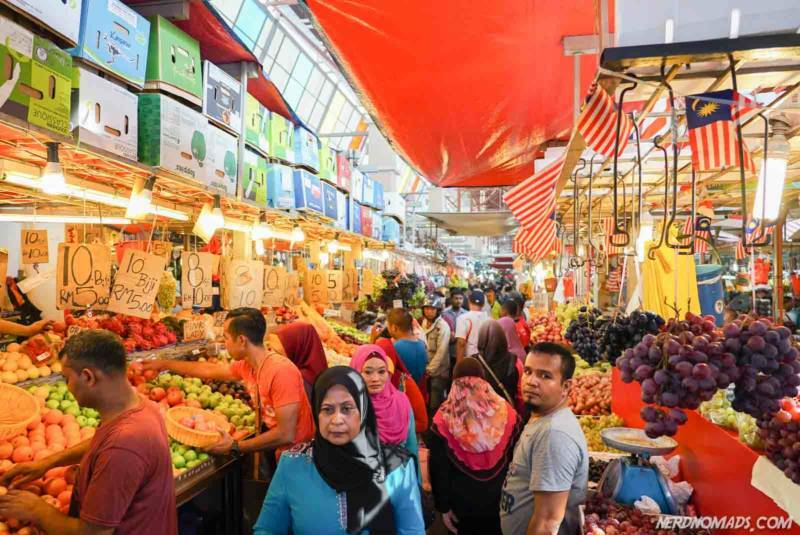 Petaling Street – The famous Petaling Street is a hectic yet fun vendor street which among all the usual tourist wares hides some street food gems. Try the apam balik (small pancakes made of coconut milk) sold by the old man in front of Koon Kee Wantan Mee restaurant. They are delicious! KL Heritage Trail – Do the KL Heritage Trail walk among the beautiful old colonial buildings, and along the soon to be restored Klang River. Masjid Jamek Mosque – KLs oldest and biggest Hindu mosque. KL City Gallery – A tourist information and a gallery of Kuala Lumpur city. National Textiles Museum – Learn how the famous Malaysian batik is made. St Mary´s Cathedral – A beautiful little church. There are some genuinely terrible hostels aimed at backpackers here. Be careful and steer away from the rock-bottom priced options! They are not worth it. If you are looking for higher-end or mid-range accommodation, you won’t find it in Chinatown. The closest is probably The Majestic Hotel, which is within comfortable walking distance of Chinatown & Merdeka Square. It’s a bustling area and the sellers along Petaling street can be quite pushy at times. BackHome calls itself a boutique hostel and the modern architecture with old influences does make for a nicely designed home away from home. Both private rooms (with shared bathrooms) and dorm style rooms are clean and comfortable. The atmosphere is fun and relaxed, and the beds comfortable with nice touches such as reading light and bedside charging point. The staff are always helpful and organize some cool tours like hiking trips to some of the mountains areas outside of KL. There is a western style cafe next door, and Hong Ngek at the end of the street serves some tasty Chinese food. The Big M Hotel is great value for the money with simple but clean and comfortable rooms complete with air-con, flat screen tv, free wi-fi and a private bathroom with hot water. There is also a rooftop terrace. Basic but clean and comfortable rooms with private bathroom at this affordable hotel located close to Masjid Jamek MRT station. The staff are the real gems of this place and take excellent care of their guests. There are also dorm rooms available at a low price. 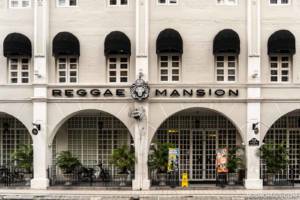 This gorgeous old colonial building is now a hip and trendy party hostel complete with an all-night rooftop bar. Stay here for the party or make sure to ask for a bed on the ground floor if you want to have a chance at a decent night sleep, and even then bring your earplugs. Some other excellent budget accommodation options in Chinatown include the friendly and cool Mingle Hostel and the space-themed capsule style rooms at the Space Hotel. These areas are the least visited by tourists of all the areas we recommend here. 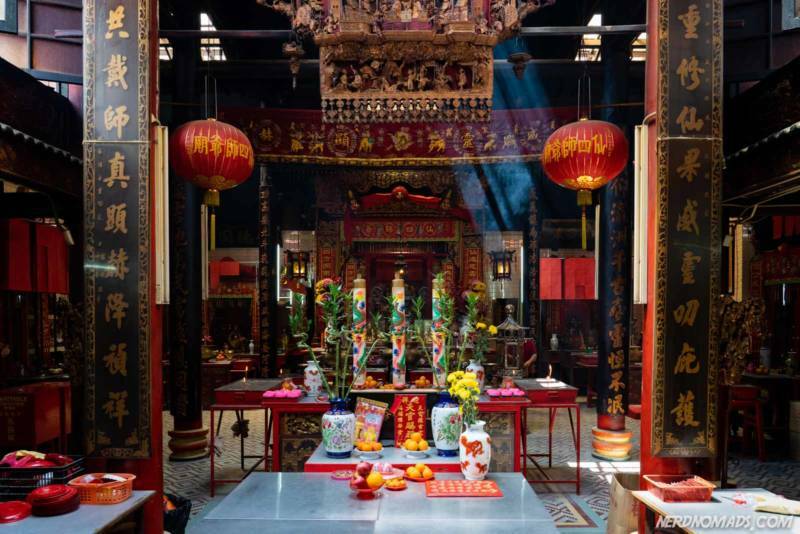 These are excellent places to explore to see and experience everyday life in Kuala Lumpur away from the shopping malls and the high-rise buildings and catch a glimpse of the history of Kuala Lumpur. 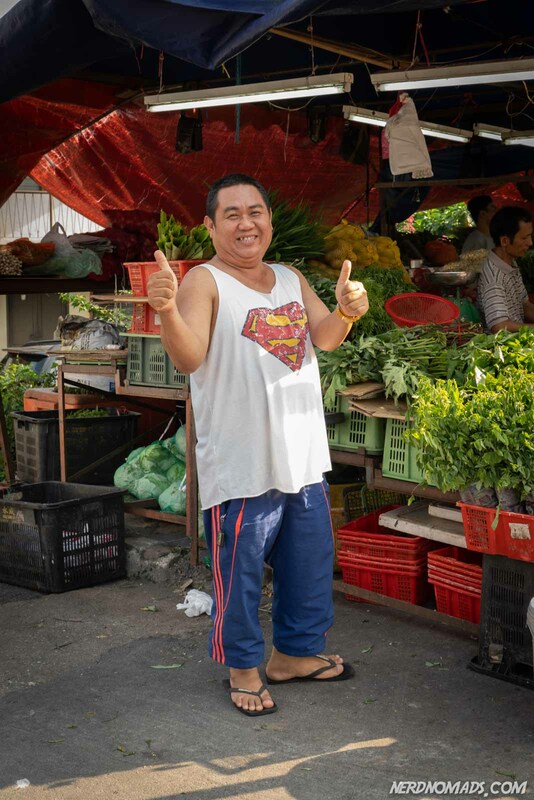 Chow Kit is a large residential area with predominantly Malay inhabitants and is home to Malaysia´s largest fresh market, known as Bazaar Baru Chow Kit. Kampung Baru, meaning “New Village,” is the closest you can come to a village inside Kuala Lumpur. It is surprisingly unchanged by time and an excellent place to see what Kuala Lumpur once was. The area oozes of the laid-back everyday village atmosphere with its low wooden houses. 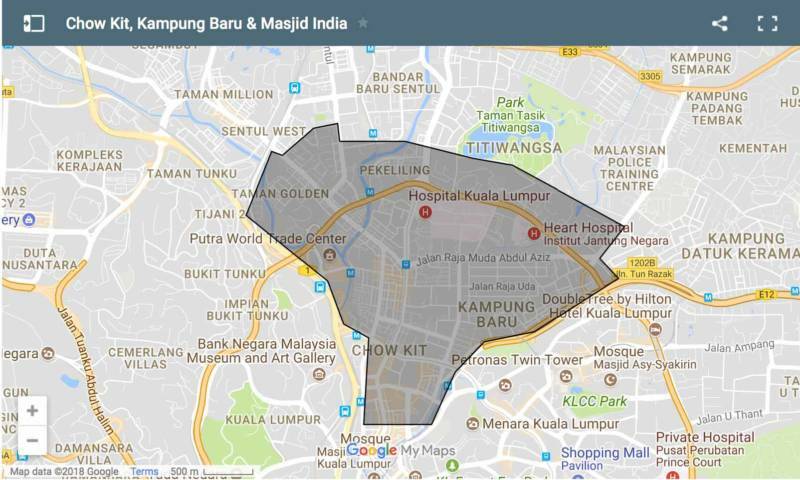 Masjid India used to be KLs Little India until 2010 when Brickfields was officially declared to be the city´s Little India. Masjid India is however still Indian influenced with lots of delicious Indian restaurants. This area comes to life on Saturday evenings when the vast street market Masjid India Pasar Malam sets up in the streets of Lg Tuanku Abdul Rahman, Jalan TAR, and in front of the Masjid India Mosque. These areas aren’t tourist destinations, but there are some sights to see and walking around the smaller neighborhoods like Kampung Baru. You can see some of the traditional Malay tree houses and get a feel for everyday life here. 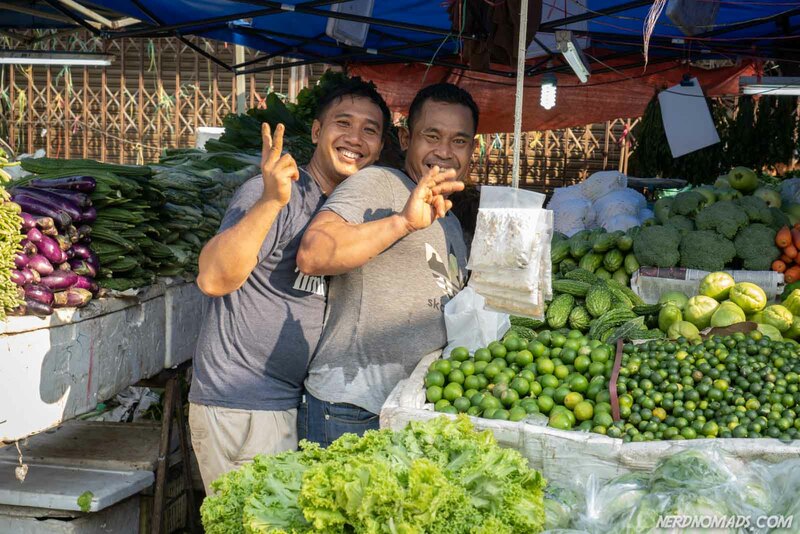 We love exploring the neighborhoods of Little India and Kampung Baru, but we prefer to stay slightly south of Kampung Baru, close to the Chang Wangi station and Masjid India. 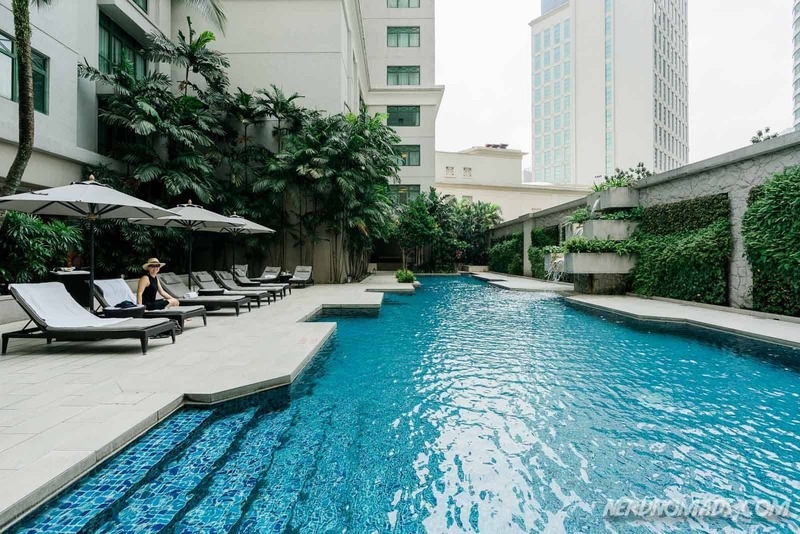 Here are some excellent top-end hotels at a reasonable price and some of the best restaurants in KL are lined up in a little street called merely The Row. The new Quill mall is also located in this area, with plenty of shops, a supermarket, and a cinema. With both the Chang Wangi LRT Station and the monorail stations Medan Tuanku and Bukit Nanas nearby, this is a very well connected base from which to explore the city. You can also easily walk to the KL Tower or the KLCC area in about 20 minutes, and to Bukit Bintang. Limapulo Restaurant – Visit our favorite restaurant in Kuala Lumpur, the Limapulo Restaurant, for the best Malay curries and Laksa! Read our guide to Kuala Lumpur’s best food for more about Limapula and other must-try restaurants and dishes! Titiwangsa Lake Gardens – Just north of Chow Kit is the leafy and green Titiwansa park, perfect for a stroll and taking photos of KLs skyline. You can even hire a motorboat, play tennis, hire a bike and go cycling, or join a helicopter trip over KL. The streets opposite the Bazaar Baru Chow Kit market becomes a red light district at night and is best avoided. If you choose one of our recommended hotels then you’ll be far away from that area and close to the Chang Wangi LRT station which is an excellent base from which to explore the city. Stripes is a new hotel that offers excellent value for money. We love the stylish and ultra comfortable rooms and the small touches like free soft drinks and water in the mini bar refilled every day, and the Nespresso machine in every room. The rooftop swimming pool is, however, our favorite and has a fantastic view of KL Tower and Eco Park! In the evenings the swimming pool area turns into a cool, relaxed open-air rooftop bar. They also have an excellent restaurant on the ground floor serving a fusion of Asian and Western food. We appreciated the five-star like service and friendly staff. This is our go-to hotel in KL, and we spend at least a couple of nights here whenever we are visiting Kuala Lumpur cause we love it so much. The Sheraton Hotel is getting a little old but is still a grand hotel that offers a lot for the money. It is a classic, elegant hotel with spacious rooms, ultra comfortable beds with quality linen and marble floor bathrooms. While the decor is a little old fashioned the rooms have been well kept and modernized with large screen TVs and every modern comfort. There is a beautiful poolside area with a lovely pool and a great gym. Breakfast is excellent with plenty of options. The location of Sheraton Hotel is excellent, right next to the Medan Tuanku monorail station and opposite the road from the Quill mall with lots of shops, restaurants, a supermarket, and a cinema. The hotel is also right opposite our favorite restaurant street, The Row, packed with some of the cities best restaurants like Limapulo. If you are looking to stay a little bit out of the hectic and busy downtown of KL, but yet find hip and modern restaurants and shops, then South Bangsar is the place! It is the perfect area to stay in for families. The South Bangsar is a quiet upscale residential area with tall skyscrapers containing new top end suites and apartments on the outskirts of Kuala Lumpur that has become a trendy area to stay in lately. It is a new and modern area with plenty of top-notch restaurants, malls, and big and posh supermarkets. 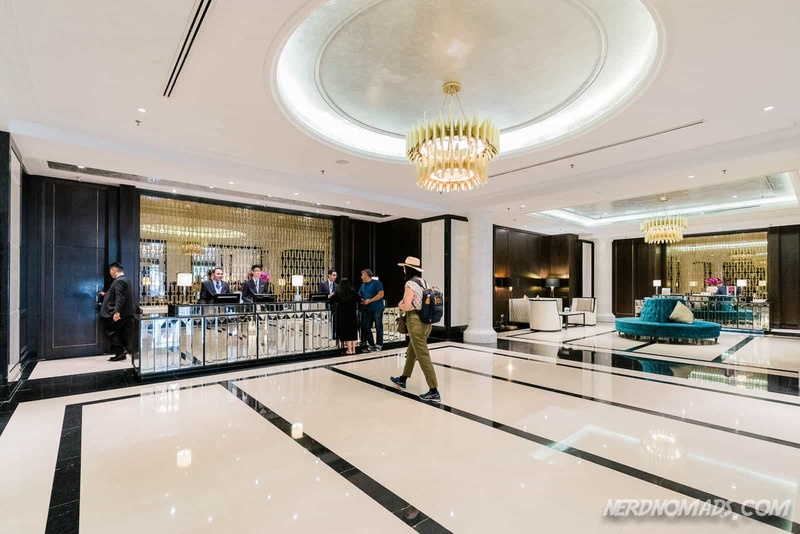 We first stayed here four years ago when we took a chance on a brand new hotel, Capri By Fraser, that looked fabulous but had very few reviews (luckily it turned out great and it is still one of our absolute favorite hotels in KL!). Back then there was really only the one hotel there, and Taxi drivers never seemed to know it, but that has all changed. Now everyone knows of Bangsar South as it has become a hip and trendy area with restaurants and cafes. 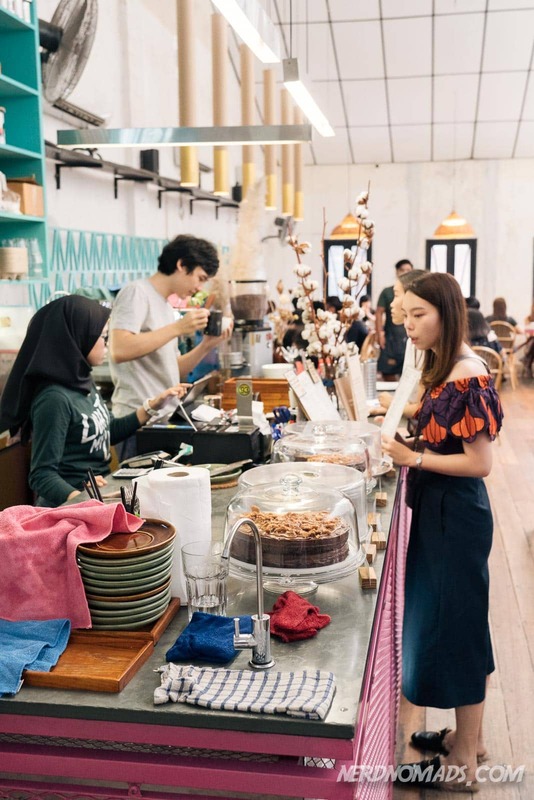 On our most recent visit in 2019, we found that new malls and hotels have been popping up all over the Bangsar South area and there are now plenty of restaurants, cafes, and bakeries to choose from within easy walking distance. Our favorite is the new Village Grocer supermarket, a great place to stock up on some food and drinks. While there are some full-service hotels here, most of the hotels are fully-equipped apartment hotels, perfect for more extended stays or if you prefer plenty of space and some time by yourself. The two LRT rail stations, Universiti Station and Kerinchi Station, make this area a good place from which to explore the city. The trip to KL Sentral takes only about 10 minutes. It is also easy to grab a taxi or Grab, which are cheap so you can easily get to whatever area you want from here. 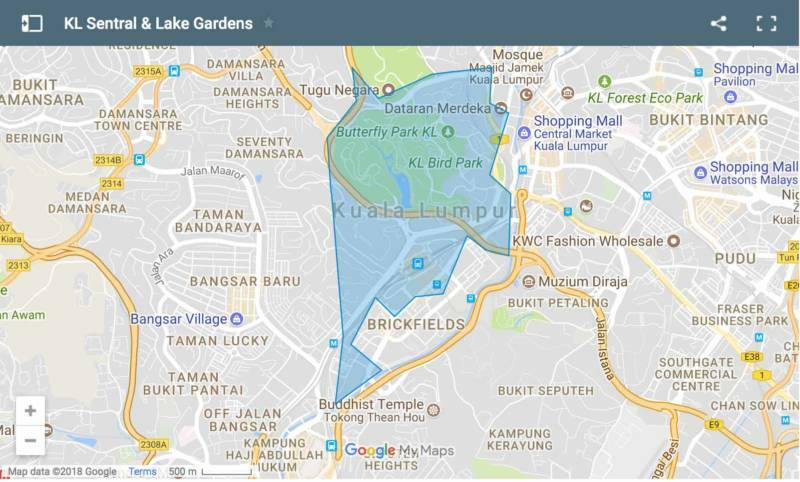 Because of the distance from the city center, accommodation here tends to be less expensive than similar apartments and hotels in for instance the Bukit Bintang / Bukit Ceylon or Bukit Nanas area. There are no real sights in this area, and you need to use the train or take a taxi/ Grab to get into the city center. This is our favorite hotel in this area, actually in Kuala Lumpur in general, and we have stayed here many times. It has become our home away from home hotel whenever we visit Kuala Lumpur as we like it so much. The apartments are super big and modern, and there are both studio and one/ two/three-bedroom apartments available. The apartments have a fully-equipped kitchen, a huge bathroom, and every modern comfort including a large flat screen tv, comfortable beds, and air con. There are washing machines and dryers in some of the floors that all guests can use (buy tokens in the reception downstairs). All rooms have fantastic views of the city and a balcony where you can enjoy the sunset. Capri is a full-service hotel with room service (great food, reasonably priced! We use their room service a lot), a pool bar and there is even a pillow menu. 🙂 The rooftop infinity pool is truly spectacular, and there is a large well-equipped gym and Yoga room. Breakfast is also excellent, and the wifi is fast. Highly recommended! Capri is our number one favorite hotel in KL! VE Hotel is a relatively new hotel with a mix of standard hotel rooms and apartments (with several bedrooms) available. The rooms are well equipped with comfortable beds, air con, and flat screen tv. The apartments come with a full kitchen and a washer/ dryer. The hotel has a great rooftop swimming pool and gym. The staff seems a little unaccustomed to running a hotel and service could be improved, but the facilities are still good value for money. There you go, our seven favorite areas of Kuala Lumpur to stay in along with our recommended Kuala Lumpur hotels. Hopefully, you now know a little bit more about the Kuala Lumpur’s different areas and deciding where to stay in Kuala Lumpur has become a little easier. We plan on expanding and improving this guide continuously so, please let us know if you have any suggestions and tips in the comment area below. If you’re looking for some inspiration about what to do in Kuala Lumpur, make sure also to read our updated and expanded guide on the best things to do in Kuala Lumpur. Also, check out our favorite restaurants in Kuala Lumpur for when you get hungry. I’m hoping to visit Malaysia at the end of the year, so this was really, really helpful. I’ve read that the best time to visit the west coast is in December and January but if you want to visit the east coast, you should go in the summer months. But when is the best time to visit Kuala Lumpur? Kuala Lumpur is a great year-round destination as it does not have a distinct rainy season. There is less rain in June, July, and August, however, but the temperature stays the same year round, around 23-33 C. July and August can be hazy as smoke from farmers doing field-clearing in Indonesia sadly come in over Kuala Lumpur. The city is popular during Chinese New Year (in January/ February) so it gets pretty busy then and accommodation prices tend to get higher. The same goes for Ramadan. Thanks, Maria! I’m planning to go at the end of November and December. I know the monsoon season hits the east coast then but not the west coast. Thank you so much! Happy to hear that you find our articles about KL useful! Thanks for mentioning us in your guide! This is such a valuable blog post. I love being able to visualize the different areas, so the colour-coded map was such a fantastic added touch. Thank you! Hi, Thanks a lot Maria, highly appreciated for giving such a detailed information. KL is nice all year round, with some rainfall now and then. But there is less rain in June, July and August.